Have you ever felt like you desperately needed a weekend at the spa but couldn't find the time or the money? Same. Like all the time. Sometimes it's not feasible, so you have to figure out an alternative. If you've had a long day & want to relax & unwind, scoop up some of these products. You'll feel like a million bucks even though it didn't cost much at all! I've never been one to have a favorite shampoo. Ever. But there's really something about this one. I can't put my finger on it. It's comforting, perhaps it's the soothing oat scent. It lathers nicely & my hair feels squeaky clean without being stripped. I would totally repurchase this! This is a seasonal body wash for Christmas time that I got on sale a few months ago. I really love the iridescent shininess. It feels like a luxury experience, like liquid diamonds dripping onto your loofah & scrubbing away the dead skin cells on your body. Majestic. This product was sent to me last year as part of my Valentine's Day Gift Guide for Her. Simply add some powder to your hand & add a few drops of water until it creates a nice paste. I've come to use it whenever I want to feel like I'm having an at home spa experience. I love the tightening feel as it's drying. St. Ives scrubs have remained a staple in my life through the years. They're affordable & effective. I saw this green tea version at the store & said "why not?" The product itself is green & has a pleasant scent. The green tea leaves are carefully picked from China. The scrub isn't harsh & leaves my face feeling smooth as a baby's bum. My hair always feels like the silkiest thing ever after using this. I put the mask on every time I wash my hair, leaving it in for about five minutes. It makes my tangles super easy to get out & I will always, always use a hair mask from now on. I don't want to live my life with out it! The fragrance is lovely as well. Sometimes you have to create your own spa experience, you know? 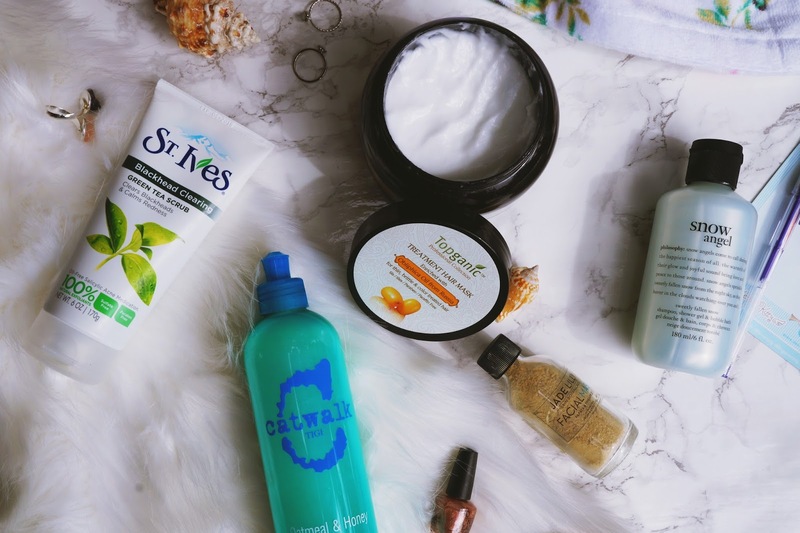 From glittery body wash to green tea facial scrubs, these products make shower time feel way more luxurious than it really is. And I'm most certainly okay with that. Those products sound amazing! I always long for my shower at night and love spending money on great shower products. Have you tried Lush's "Ro's Argan Body Conditioner" yet? It's my favourite! Thanks for sharing! 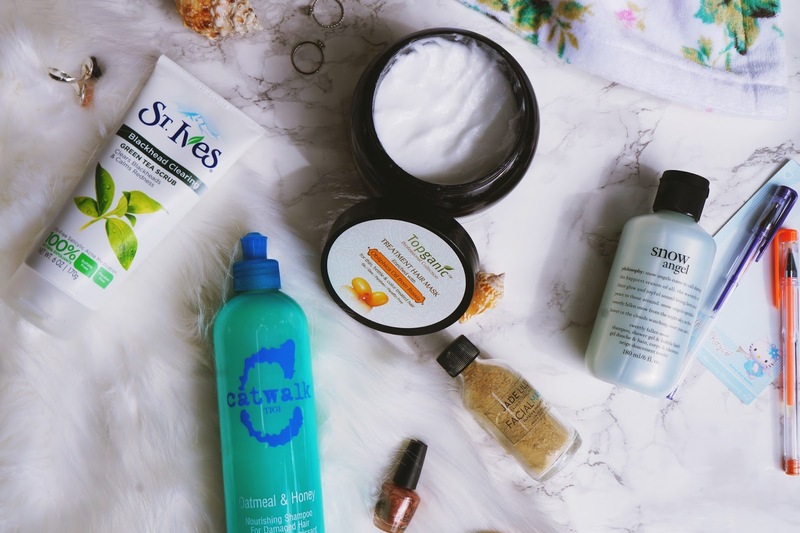 I haven't check out the St. Ives scrubs in so long - I am trying to get into a better beauty routine to prep my skin for my wedding (and to just in general - be a better steward of my skin). Will have to check them out again! 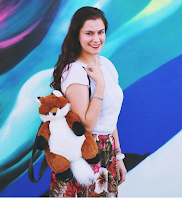 I love philosophy products too! All of these sound absolutely amazing! Especially that honey nourishing shampoo! Score! I usually see these posts and haven't heard of any of the products. I use the St. Ive's Green Tea and Orange face scrubs. Love them both. I wish I could find the St. Ives products here, I have been wanting to try their scrubs for ages! 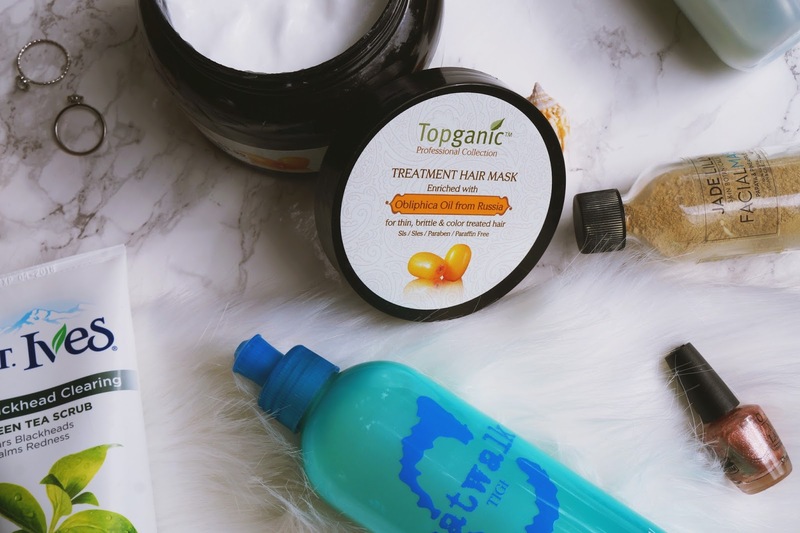 The Topganic hair mask sounds so nice. I don't know when the last time I did a hair mask was so I probably need one. hehe. I love that St. Ives scrub, and that face mask sounds really cool - I really should try it! I know it is hard to get away to do a spa day. I am such a fan of St. Ives and have used for years! I just started using a hair mask and they are so amazing for your scalp! I need a good hair mask! My hair gets so dry during the summer months. Going to check these out! I had these products a little while back from Natural Instinct (an Australian brand) that made me feel like I was getting a professional facial everyday. Smelt so good and felt awesome too. These are great suggestions, especially when it is not feasible to go to a spa. I'm familiar with St. Ives products, but have never used them. I'll take a second look and treat my body right with the scrub. Indeed, self-care is important. I like those products and create some of my own for the house to save money like sugar scrubs and scented shower fizzies for the shower! That goes a long way, too! Oooooh I definitely want to try that hair mask! I like this list especially since they are all so affordable. I have tried the St. Ives green tea scrub and its so good. I live in Cyprus and we don't have all brands here, I either have to order online or tell my friends that live abroad to send me some! !